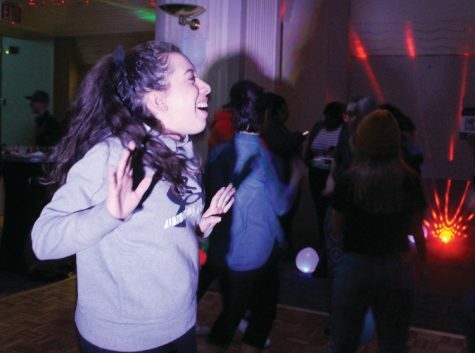 Jacquelyn Hearn, a sophomore dance major, dances to the music during SAEM club’s “End of the Year Bash”. The music at the event was provided by a DJ from the now-closed Cruze bar. 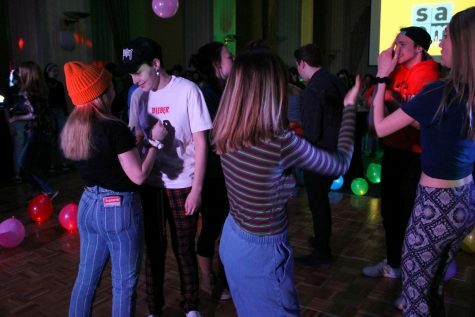 On April 3, 2019, SAEM Club held its End of the Year Bash in the Lawrence Hall Ballroom. The event was chock-full of lights, balloons, pizza and mocktails. According to Nate Grossi, the president of SAEM club, this party was a great end to a successful season for the club. Grossi, a junior SAEM major, said that the club started with the idea of giving students the opportunity to de-stress in a way that was popular with them in the past, so they reached out to the DJ from the now closed Cruze Bar and planned from there. 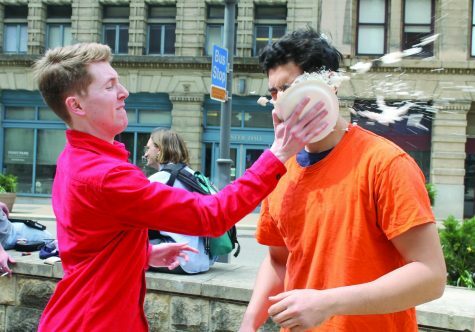 “We just knew that it was popular with Point Park students so we reached out to him and picked a date that he could do,” Grossi said. From there, the club got lights to fill the ballroom, planned the mocktails they would serve and then reached out to Pioneer Records so they could premiere the music video for Allissa Logsdon’s new song. 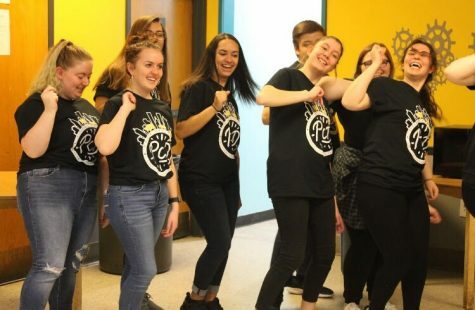 “The music video class and Pioneer Records worked together to do the music video and at 8 p.m. they’re going to debut that in our event,” Grossi said. Aimee Renninger, sophomore SAEM major and operations intern at Pioneer Records, said that this event was a great opportunity for the two student organizations to work together. Grossi said this event not only gave students the opportunity to de-stress, but also gave SAEM club members the chance to celebrate all of the events they put on this season. Some of the events they held this year included a lip sync battle with special guest Miss Coco Peru, a performance of the Rocky Horror Picture Show, a performance by Chris Jamison from The Voice and Point Park Has Talent. Renninger also said she believes that this party was a nice way to close out the school year. Pioneer Records recently finished recording and premiering Logsdon’s first EP. 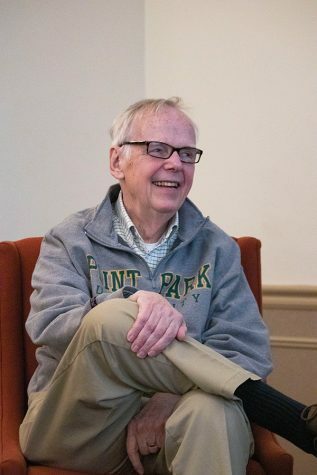 In the future, Renninger said that Pioneer Records will continue working with artists that are students at Point Park through their booking agency. “We’ve been putting on those artists that aren’t necessarily Pioneer Stars but they’re still artists that go to Point Park, and just giving them shows around Pittsburgh and on campus,” Renninger said. As far as future plans for SAEM club, freshman SAEM major Shea O’Neill said that she’s very excited for events that are in the works. Students took to the dance floor during the “End of the Year Bash,” put on by SAEM club. 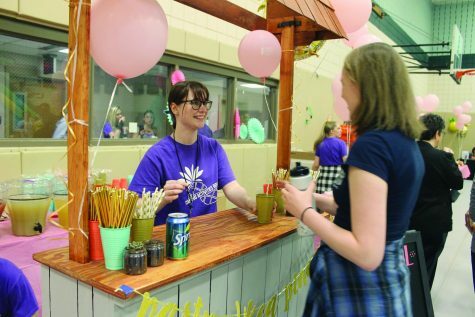 O’Neill said that a lot of work and planning went into the End of the Year Bash, and she was excited to see how the planning comes to fruition. 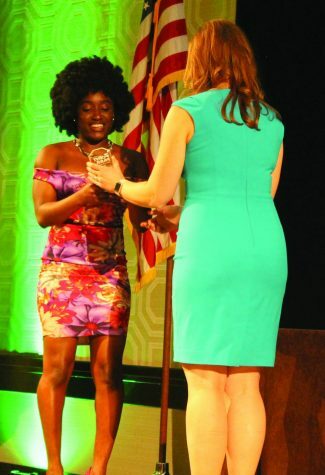 O’Neill, who was just nominated to be the Vice President of SAEM club starting next year, said that Point Park and SAEM club have already given her valuable experiences both for her college experience and her career path. Lexi Borgia, a sophomore SAEM major that attended the event, said that getting involved on campus in clubs like SAEM club and many others, is vital to your college experience. 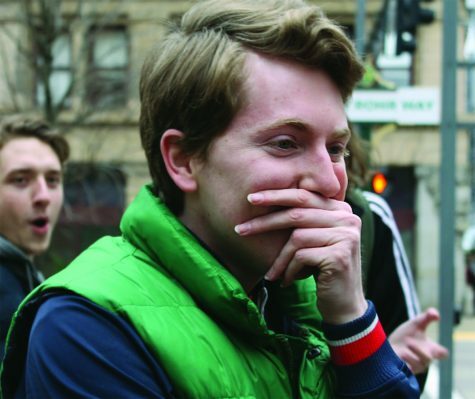 “It’s really important, and anybody on campus should get involved with anything, even if it seems like you wouldn’t be into it,” Borgia said. “You could meet some really awesome people this way, and it just upgrades your college experience.” She also said that events like the Bash give students a healthy alternative to either sitting in their room, or getting into dangerous situations at outside parties. As far as advice for students looking to get more involved, Borgia said that Point Park makes it easy for you to find an event or a club that is the right fit for you.